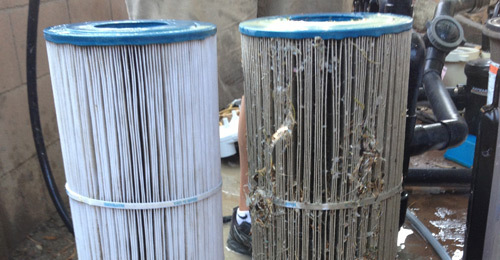 Cartridge filters need to be cleaned at least 2 times per year and sometimes more depending upon how much debris falls into the pool or how small your filter is, the larger the filter the less often it needs to be cleaned. A good lifespan for cartridges is 4 to 5 years. We’ll go over the steps needed to clean your filter system. Step 1: Shut off the power to your pumps or if you have an automated system set the mode to service. Step 2: Open the drain plug at the bottom of the filter tank, then open the air bleed screw at the top of the filter tank. Wait until all the water drains out the tank. If you have a solar heater system, make sure to either close the shutoff valves or rotate the solar valve so the solar is off, if it’s an automatic valve make sure to use the toggle switch to rotate it, if you manually move an auto valve it will damage it. Step 3: Now you’ll need to open the tank up. Some filters have 1 nut and clamp holding the tank halves together and some will have as many as 7, you’ll need to determine which one is used. Once you have the clamp off the upper half should lift straight up, if it doesn’t you can use a blade screwdriver and carefully pry to release the lid. Step 4: Carefully lift out the cartridges from the tank and set them aside. Some filters have a manifold above the cartridges that will need to be removed first. Step 5: Start hosing the filter elements with both a side to side and up and down motion. Start from the top and work your way down. When you think you have them fairly clean flip them over and repeat the process. Some cartridges have both inner and outer cleaning surfaces so be sure to check. Finally make sure to hose off the bottom surface where they sit into the plumbing. Normally the bottom side of the cartridge will have either water ports or if the top and bottom look the same the side that does not have the raised words is the bottom. Step 6: Hose out the tank and the little air bleed filter, clean the lid mating surface and clean the o-rings. Apply a thin coat of pool lube to all the oring surfaces to help seal the unit and prevent leaks. Too much and it will attract dirt and slip out. Step 7: Check for any cracks or tears in the filter including the top and bottom molded part and the air bleed filter. Reinstall the filters the same way you took them out. Tighten the clamps in an even pattern using the mallet to slightly tap the clamp onto the mating surface. Reinstall the drain plug. Step 8: Return all solar valves back to their normal position if you changed them. Open the pump basket and fill with water for a minute, now close the lid. Turn power back on and reset timer. Manually turn the pump on until it primes and let it run for a minute while checking for leaks. Open the air bleed screw now until water comes out and close. Your filter system should now be ready for another 6 months of pool service.